This real butterfly wing necklace is made with Parthenos sylvia AKA Brown clipper butterfly. Butterfly lived a full life and died naturally after its full lifespan. Purchases help save the rain forest and butterfly populations. This is one of my top 10 favorite butterflies. The wings and pattern on wings are unique and and remind me of bangle tiger. 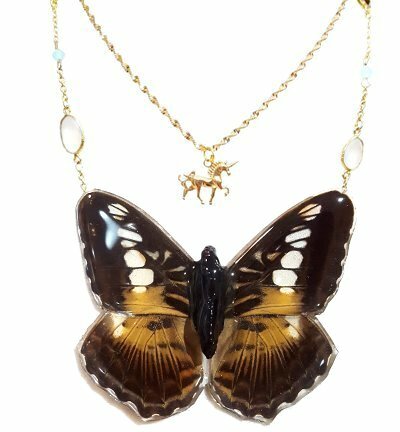 This real butterfly wing necklace is handmade to perfection. We have been preserving real butterfly wings in resin for real butterfly wing jewelry since 2012. 18K Gold filled Wave Chain.